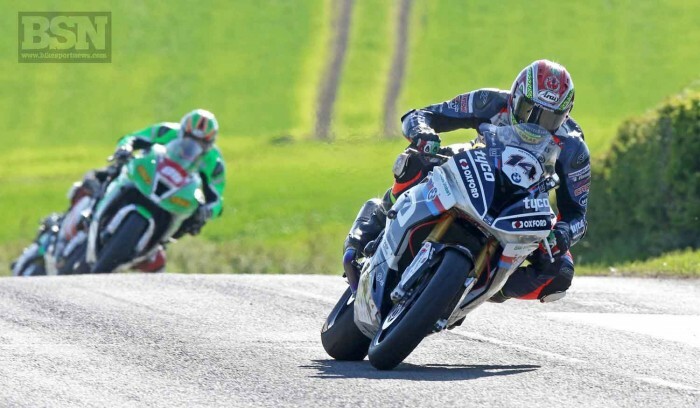 Derek Sheils and Dan Kneen shared the wins in today’s Superbike double-header at the Around A Pound Tandragee 100 road races. In the first race Sheils converted his pole position in to a win after a thrilling battle with Derek Mcgee. It was McGee who got the advantage off the line with Kneen close behind on the Tyco BMW and pole-man Sheils in third. The leading three made the break at the front with Kneen dropping into third leaving Sheils and McGee to trade the lead through out the race. Kneen following closely behind. On the penultimate lap, Sheils was holding the lead when McGee made an attempt to pass but ran wide, the error allowing Kneen to pounce and steal second place. At the flag it was Sheils, Kneen, McGee, William Dunlop took fourth with Shaun Anderson completing the top five. Kneen broke the circuit lap record with a lap in the 1’55s - an average speed of 109.609mph around the 5.3-mile County Armagh circuit. Superbike race two, the feature Tandragee 100 race, featured the same group who took to the front only this time Skerries man Michael Sweeney was also in the mix. In close to perfect conditions, the four fought it out at the front and as in race one it was Sheils and McGee who tussled for the lead. This time out Kneen was fourth in the leading quartet and meant business, picking the leaders off one by one. Kneen hit the front on the final lap while McGee moved into second relegating race one winner Sheils to third with Sweeney at the rear of the leading pack. At the flag it was Kneen , McGee and Sheils with less than half a second between them, Sweeney was fourth and Adam McLean fifth after William Dunlop and Davey Todd had a coming together both of them crashing out unhurt.